Just in case you're in the mood for something really over the top in the bacon department, I want all you baconistas out there to know that down in Snook,Texas ( population 568) there is a truck stop ready to serve you up a death defying platter of your favorite food, dipped in milk, dredged in flour, and deep fried in hot lard. And for that added extra little something, they serve it up with a big bowl of thick cream gravy to dip it in. The locals call it a heart attack on a plate. I call it about 5000 calories per serving and God only knows how much saturated fat. Don't mess with Texas. Now, don't think I am anti-bacon. I follow the internet bacon cult religiously. I read bacon blogs. I've checked out the bacon forums and bacon haikus. I've even toyed with buying a bacon iphone case. I'm a dedicated bacon lover and a regular bacon eater. 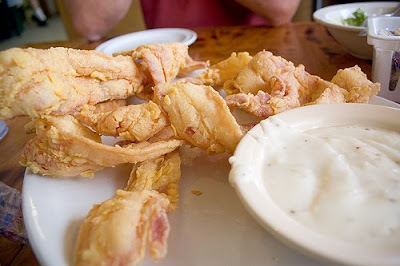 But chicken fried bacon is more than even I can stomach( to coin a phrase). Keep that stuff in Snook. Long live the BLT. Watch the video and pass the Alka Seltzer, please. I'm with you Robie, chicken fried bacon seems a little over the top...even for a bacon lover! Fun post! I dunno... I knew someone who'd have cheese sauce on hashbrowns with sausage gravy over the lot, so chicken fried bacon sounds pretty tame as far as calories and cholesterol!! Great post!